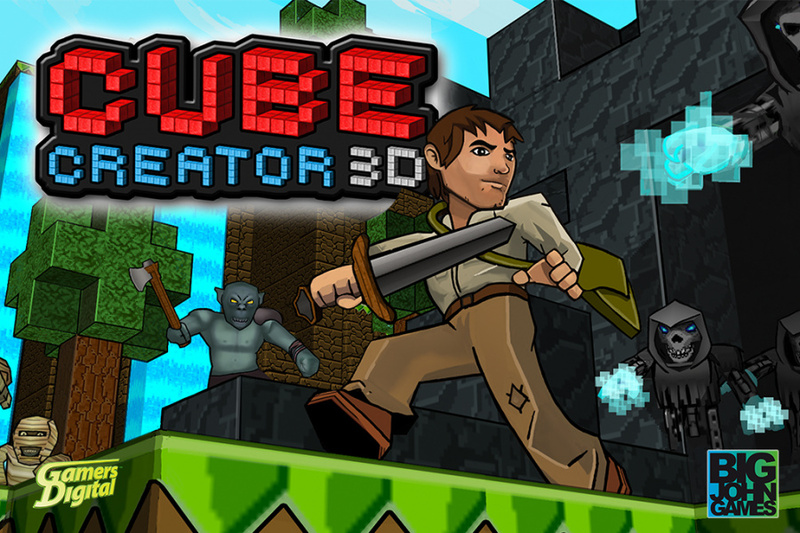 Cube Creator 3D is a Minecraft-alike which is coming to the 3DS soon from Big John Games, and the developer has gotten in touch to tell us about the game's Survival Mode. 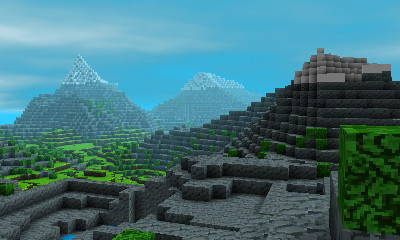 Like Minecraft - from which Cube Creator 3D clearly takes inspiration - the Survival Mode is all about gathering resources. There is a day and night cycle, as well as the ability to sleep. There are portals that will take you to the different environments - Forest, Desert, Tundra, Mountains - and non-player characters that drop resources when slain. To improve your chances in combat, you can equip various items of armour. 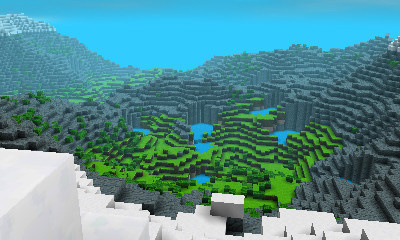 The game's Creative Mode on the other hand offers five unique environments - that's all of the ones available in Survival Mode plus a plain, flat environment. You can have up to ten 'creative' worlds and a single 'survival' campaign running at one time. Big John Games has confirmed that the Cube Creator 3D demo has been downloaded 250,000 times since it launched in December last year, while the full game is currently in lot check and should be released on the eShop shortly. "Tribute"? Is that what we call rip-offs these days? Is this the one with gokarts? @Xilef I guess that calling it a "rip-off" would immediately result in rampage DMCA takedowns on any game related material, as is often the case lately... I'm gonna repeat myself here and say that in my opinion those Minecraft clones are completely unnecessary, irrelevant, and I can't fathom a reason for them to exist in a world when official Minecraft (which is what people want, apparently) works on every device around, probably not excluding printers and microwave ovens. They'd have more downloads on that demo if they released it in the UK too. Looks much, much better than Battle Miner. Does it use the C-Stick? @jpfan1989 This one really has Go-Karts? @Xilef - Wow, I was going to post almost exactly that word for word. Well close anyway - "Tribute" is that what we're calling it these days?" "Tribute" is way, way too generous. It's such a shameless ripoff. I dont understand how anyone could literally copy an entire game, change the textures and make the 'enemies' look terrible. And tribute? Seriously? It probably isn't a bad game, I'm just against unoriginal ideas. @Kifa Every device, that is, except for Nintendo systems. Which is what we're discussing here? You know, NINTENDO Life?? @abe_hikura if that's the case there is still hope then but the thing is are Nintendo willing to pay for it? That's exactly what I thought the moment I saw it. Everything about the game is a downgrade from Minecraft, from the music, graphics, controls, and unstable fps as well. 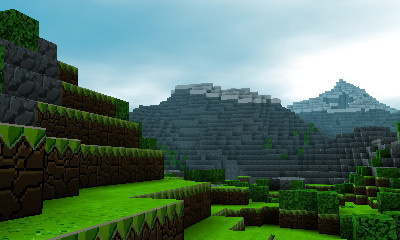 @FullbringIchigo who knows, after all minecraft dose feel like a natural fit for Nintendo, Various members of nintendo have mentioned minecraft being brilliant but Nintendo also doesn't like going out of their way to play "me too"
I like it, hope it gets to Europe soon. Mm... this seems like a patched job of Minecraft. While it provides different elements, the foundation is the same. 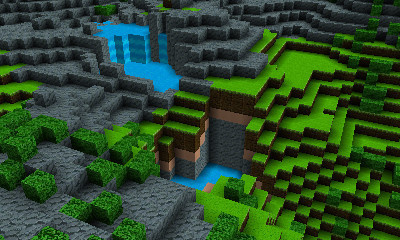 Plus, mechanics that I felt made Mincecraft unique was its realism in the midst of non-realism physics. Gold=weak. It took longer to mine out diamonds than it did for cobblestone. You couldn't just mine out gold with the same kind of pickaxe you use to mine iron. Yes, this is a different beast, but it's too hard to not compare it to what it supposedly pays tribute to. well, I guess if Mojang wasn't going to do it, someone should. I love everything about the demo except the controls. Sometimes when I wanted to jump I would float, moving the cam was bad, and moving was really weird. Hopfully it has Circle Pad Pro and C-Stick support so that you can move with the circle pad and do the other stuff with A, B, X, and Y buttons. Nice to know it will be released soon! I really want this one. This looks great, Minecraft isn't coming to a Nintedo platform ever, so this is will have to do, I personally prefer Terraria to Minecraft. @Robo-Knight Actually the one with karts is Ucraft supposedly it'll go into open beta in July with karting integration with the sdk paint program and a first person shooting mode. Ripoff, tribute, whatever. Who the hell cares? It looks fun so I'll probably buy it. My kids are enjoying the demo too and I'd rather spend $20 or whatever on this game than $200+ on a new console to play Minecraft on. I thank Big John Games for realizing that. Honestly, this looks more fun anyway. If u don't like it, don't buy it. @jpfan1989 That was the WiiU "Minecraft", I believe. @Ninty4thewin If you hate 'unoriginal' ideas you should given on life mate. I just played the demo and I'm really hoping that they fix realism like lava melting snow and fall physics for water and lava cause that kind of ruins it for me. 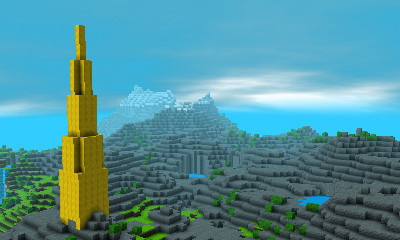 Otherwise, the game looks really nice for a Minecraft clone. Also, looking forward to control options because using the left stick to jump and fly is a bit awkward. @Kifa You're aware that Minecraft is not available on 3DS and Wii U, right ? @geekdadfr Of course I am. Point being? I can't imagine anybody not owning any other platform that Minecraft is on. Even the computer you use to write comments here on Nintendolife can run it, so why do we need the same game on another platform? How would that be beneficial to anybody? @Kifa You wrote that Minecraft was working on "every device around", so Wii U and 3DS are not devices ? some people's second device besides their console is just a smartphone. Some people do not like the inferior version of Minecraft available on mobile phones and want a better gaming experience. while I'm using my computer to write comments here on Nintendolife, this computer is not available for anyone at my home to play Minecraft. The Wii U is available. The 3DS is available. If 250000 people downloaded the demo version of Cube Creator 3D, don't you think it proves there's a real demand for a 3DS version of Minecraft ? Because you don't need it doesn't mean that other people won't be happy that it comes.